These products was submitted to us free of charge (by way of gireviews.net) for review. We have never done any work with or for Defense Soap. One of the quicker growing markets is that of soap, specifically soap engineered to address the most common health problems that afflict jiujiteiros and MMA fighters: skin conditions. These range from mild irritations to ring worm to potentially fatal staph/MRSA. One company that has been at the forefront of this market and tends to be considered an industry leader is Defense Soap. Over the course of about 5 months I used these products to get a feel for the quality of Defense Soap’s offering to the market. I’ve honestly never felt so clean as when I used this shower gel. The tea tree oil smell is pretty strong, so if you like that scent, you’re in luck. I’m personally not crazy about the smell of tea tree oil, but I can’t even complain about it after how nice this stuff made my skin feel. As soon as I started to lather up, the soap took on a light, silky feel. The instructions have you wait between thirty and forty-five seconds before rinsing off to “let the soap penetrate the skin”, and while I was worried that waiting so long would irritate or dry out my skin, I turned out to be pleasantly wrong. My skin took on a “squeaky clean” feeling, and after I got out of the shower and toweled off, my whole body felt moisturized without the sensation that I had a synthetic, greasy film over me. Get your Defense Soap Body Wash Shower Gel at Amazon! My favorite thing about this, though, was how I smelled after I was dry. While some soaps leave you smelling like, well, soap, this one just left me smelling like a really clean human being. I was probably a little too excited about it and kept sniffing myself, but I couldn’t help it. The only downside to this gel is that it does sting a little; if you weren’t sure if you had mat burn or a tiny cut somewhere on your body, you’ll be made aware of it. However, the stinging was minimal and went away after a few seconds. I often head straight from jiu-jitsu to do strength and conditioning, so these wipes were just what I needed. Rather than having to hurry up and rinse off in the gym shower, I just gave myself a quick wipedown while I was in the process of changing, and I was all set. The wipes and the soap left a similar scent, and while I didn’t feel like the wipes were adequate as a shower replacement, I did feel a lot less smelly, sweaty, and gross after using them. The only complaint I might have had about the wipes was that the container was too large to really be considered “portable”, but that’s where the portable wipe packets came in. The little box of individually wrapped wipes easily fit into the smallest pouch on my backpack, and if I knew I’d need a wipe or two while I was out, I could tuck one or two into my purse or even my back pocket. Overall, I’m really a big fan of these. I keep the larger container in the bathroom at home and carry the portable wipes in my backpack so I’m never at risk of smelling like twenty people’s sweat if I have to go somewhere immediately after jiu-jitsu. 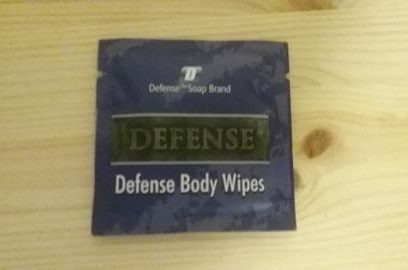 Defense Soap’s wipes are, in my opinion, the best on the market. I’ve tried other brands’ wipes and nothing compared to these insofar as the feeling of cleanliness after using them. The individually wrapped wipes are easier to transport but I feel like the tube gives me access to more at once. If you grapple somewhere that may not have a shower, you owe it to yourself to have this with you. I normally only use bar soap if I have no other choice (The idea of it sitting in my shower collecting germs weirds me out), but even as a bar soap hater, I liked what Defense had to offer. The soap has a mild scent, and unlike the shower gel, it doesn’t sting at all, even when it hits little cuts or scrapes. It was gentle enough to use on my face and didn’t leave my body feeling like it had a waxy film over it like many other bar soaps I’ve tried. Personally, I still prefer the shower gel, but if you’re a fan of bar soap, you might really enjoy Defense’s take on it. By far my favorite soap from the batch of products I was sent. The baby soap was as potent and powerful feeling as the peppermint soaps, but didn’t dry my skin out at all. One thing I noticed about all of Defense Soap’s products is that they have a scent similar to machine oil. This combined with the fragrances that they use actually smells pretty good, but it takes a bit of getting used to. The baby soap had this scent combined with a citrusy scent. Averi: I’m a child at heart, so any hand soap that foams is instantly ahead of the pack in my book. The hand soap that Defense offers carries that same scent given off by their shower gel, and it leaves your hands smelling just as clean. It was a little more watery than other foaming soaps I’ve used, but not to the point that it made a mess. It didn’t dry out my hands or sting all the tiny invisible cuts that my hand sanitizer told me I had. I ended up using it as my default bathroom hand soap, but I could see this being a great addition to a gym bathroom as well. As much as I like how the Defense soaps smell and feel, I did end up getting my first ever minor staph infection on my knees while testing out the products. I initially tried treating it using the Defense essential oil and healing salve, but while the products, again, smelled great and seemed to moisturize my skin, the infection didn’t clear up and started to spread. I ended up getting rid of it with antibiotics instead. However, when used on mat burn between the wound and a bandage, the products seemed to do a good job of protecting the area while it healed. Like the other products, the oil carried a fairly strong scent (being a mixture of 50 percent tea tree oil, 25 percent eucalyptus oil, and 25 percent jojoba oil), but the salve’s odor was a lot more mild. Defense claims that this foam acts as a protective layer between your skin and, well, everything you come in contact with when you’re sweaty and rolling with other people. When applied, it’s invisible, odorless, and surprisingly non-greasy. A little bit goes a long way, so even if you apply the foam to your entire body (as is recommended) before every training session, you’re unlikely to run out too quickly. I hadn’t been using it when I got my aforementioned staph infection, so it’s hard to say if it would have prevented it, but during my time using it, I didn’t get any other skin problems. As an added bonus, my skin felt softer after using the foam, and I felt like daily use was undoing at least some of the drying damage that sweating and showering so often can do to my skin. It felt like Christmas in August when I washed up using the new peppermint oil soaps Defense has created. The smell is incredible and invigorating, and the post-shower scent left on my skin was pleasant without being overpowering. Neither the shower gel nor the bar seemed to have a different effect on my skin than their original counterparts in terms of how clean I felt, but I did prefer the scent to the tea-tree oil aroma given off by the other products. I think if I were to purchase Defense soaps for myself or as a gift to a friend, I’d definitely go with these simply because of how nice they smell. Defense Soap touts itself as producing denser soaps than most other companies which means their bars last longer, I learned the significance of this when trying their peppermint soap bar. Definitely a good product, and like its bodywash counterpart didn’t dry my skin out. As for the body wash, I was pleasantly surprised by this product because it didn’t dry me out like Defense Soap’s standard line of bodywash does. The peppermint smell combined with the machine oil scent I described earlier is very pleasant so this bodywash gets high marks from me. 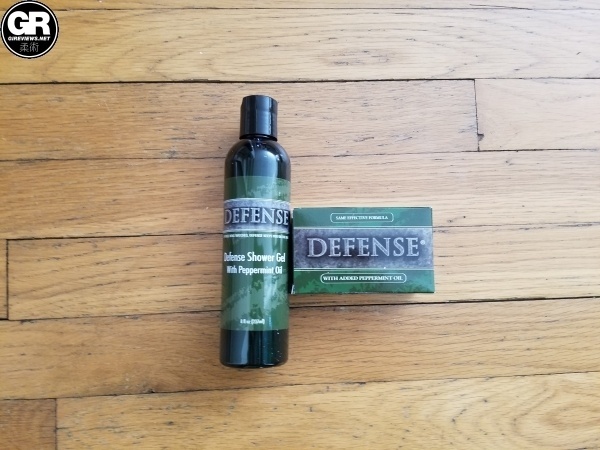 I’m not really prone to typical skin problems that come with doing jiu-jitsu or wrestling, so personally, it’s hard to say whether or not Defense Soap did or didn’t prevent my from getting any bacterial or fungal infections. I’m very open to the possibility that the staph infection I got was more my own doing, having not been using the barrier foam and possibly exacerbating the problem by shaving my legs with a contaminated razor. The salve and essential oil are both soothing, and I’d recommend them for things like mat burn or other wounds that might need to be covered with a bandage, but at least in my case, they weren’t too useful for staph. All of that aside, though, I really loved how all of the products made my skin feel, and I’m particularly fond of the wipes and peppermint soaps. I never felt like my body wasn’t thoroughly cleaned even after feeling like a walking petri dish just minutes beforehand. I’d definitely recommend these products to anyone who does jiu-jitsu or wrestling, and the hype I’ve seen over these products is well-deserved. Defense Soap has built a reputation as being the leader in combat sport related soaps. It was interesting to try their product lines. I would highly recommend that anyone who does combat sports find a soap that they like that is designed to kill mat borne illnesses, and Defense Soap is a great option.